The Lascal KiddyGuard is designed to withstand up to 200 pounds of strike force. 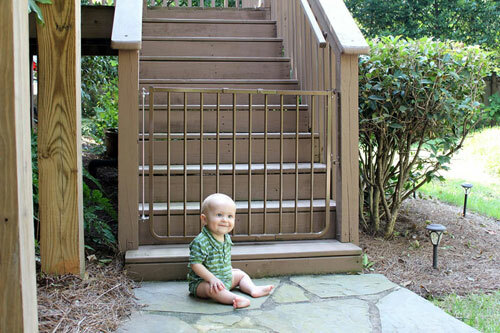 Stair gates are one of the simplest things a parent can get to make their household much more safe for little ones, however only certain gates are appropriate for use on stairs. While most stair gate models are swing gates, there are also a select number of reliable retractable baby gates for stairs. 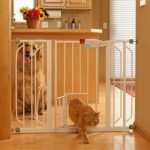 Both retractable and swing gate styles work well, but retractable baby gates offer some convenient features that some parents prefer. The greatest difference between the two types of gates is that retractable models essentially disappear when not needed. Some parents also find that retractable gates are easier to operate one handed compared to swing gates, and they may also prefer the sleek modern look they provide. 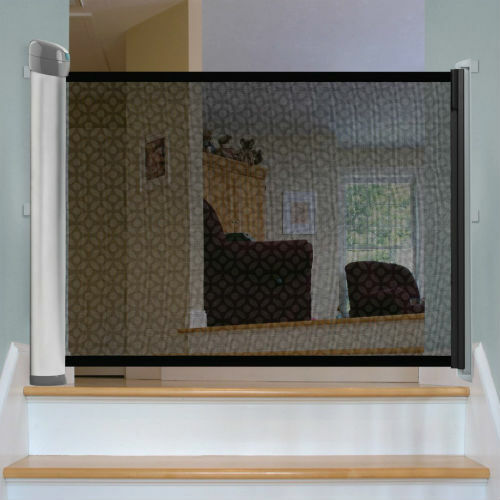 If you’ve decided that a retractable model is the right fit for guarding the stairs in your home, we’ve consolidated information below on some of the most popular retractable baby gates for stairs. Read on to get details on these models! 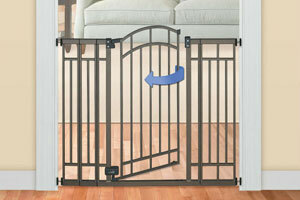 The Retract-A-Gate Safety Gate is an extremely popular and highly-rated gate. Safety and usability are at the forefront of this gate’s design. It has a child safety lock on the top for extra security against curious little ones, and it is JPMA certified for use at the top and bottom of stairs. It is also designed for easy one hand operation and opens and closes quietly. Other than the exceptional safety features, part of the popularity of this gate is explained by the variety offered in the gate’s size and color. It comes in two sizes: a standard 52″ wide version and an extra-wide 72″ version that runs about $30 more. 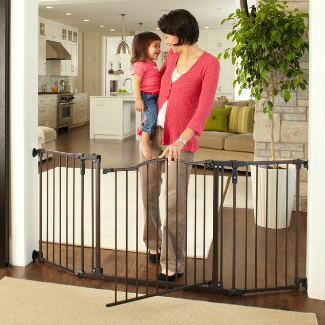 For colors, parents can choose from White, Black, or Cafe to get a gate that goes most stylishly in their unique home. Another factor for its popularity is its high-quality material. 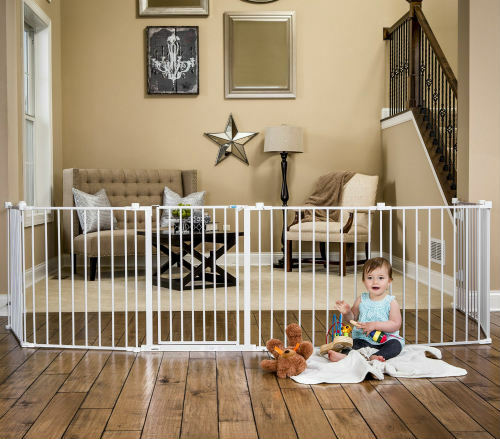 Many mesh retractable baby gates are can be weak, but the Retract-A-Gate system uses a high quality mesh that is both sturdy and scratch resistant. The Retract-A-Gate is priced higher than some other models, but the consensus is that the value of this dependable retractable baby gate for stairs is well worth the price. See full customer reviews and prices on Amazon. The Kiddyguard Avant Baby Gate by Lascal is another high-quality retractable baby gate for stairs, boasting strength as well as an attractive and functional design. 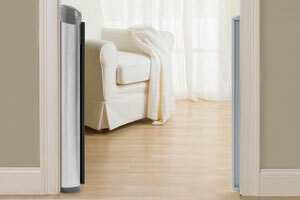 Lascal is a Swedish company that specializes in baby gates and carriers. They have a reputation for high quality products. That high quality understandably comes with a bit of a price tag as well, and the Lascal Avant is similarly priced to the Retract-A-Gate. 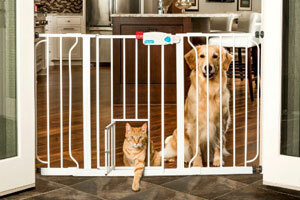 In respect to its strength, this gate’s mesh can withstand up to a 200 pound strike force. That’s much more force than any toddler can possible muster! 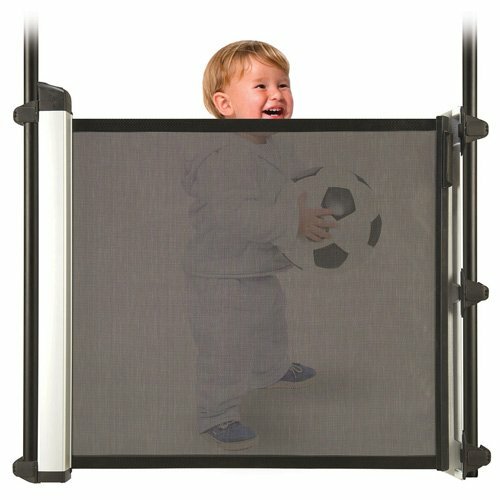 It features a delayed release button that helps smooth the opening of the retractable mesh gate, and comes in white or black. 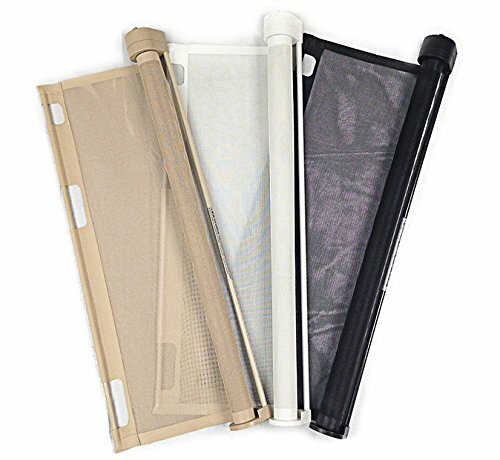 It stretches to cover spaces up to 48″ wide. The width is enough to fit any standard opening and is suitable for the majority of staircases. Buyers love that this gate has a modern, stylish look. While the Retract-A-Gate and Kiddyguard are both terrific retractable baby gates for stairs, they are rather highly priced. The Summer Infant Retractable Gate provides a good value for money option as it comes in at nearly half the price, while still maintaining acceptable quality. This model is again made of mesh; this gate’s mesh is black with a subtle decorative pattern. It’s designed to be durable and user reviews confirm that in general this gate stands up to daily use well. The gate features a top housing unit with a simple locking mechanism for operation. To lock the gate you just push down on the mechanism, and to unlock you simply need to pull up. This is not the tallest model and stands at 30″ tall, which makes it suitable for use in homes where children are not tall enough to reach the top of the gate. 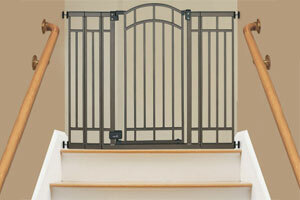 We hope our overview of these retractable baby gates for stairs has helped make your search easier. 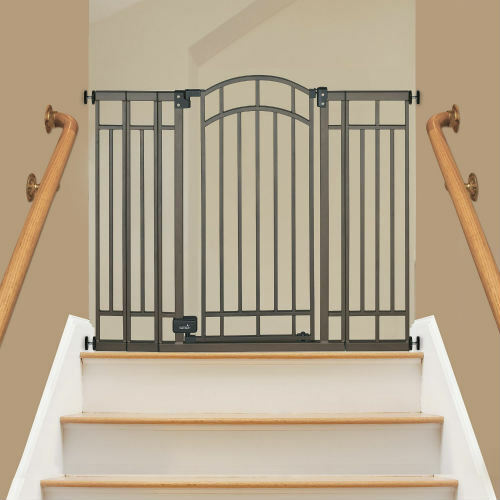 If you’re still on the fence about which type of gate is best to blockade the stairwell of your home check out our article on the best baby gates for stairs to compare retractable and swing gates. 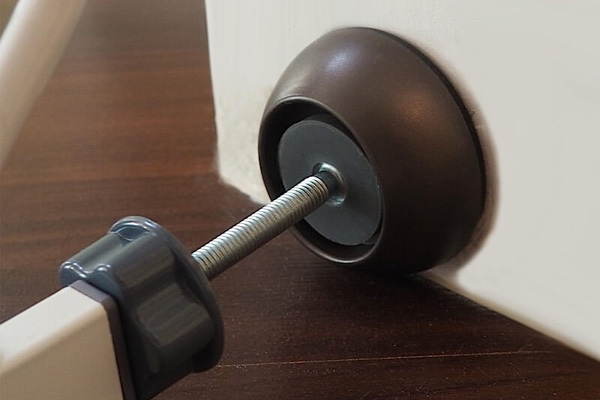 An inexpensive solution to prevent damage to your walls from pressure mounted gates. 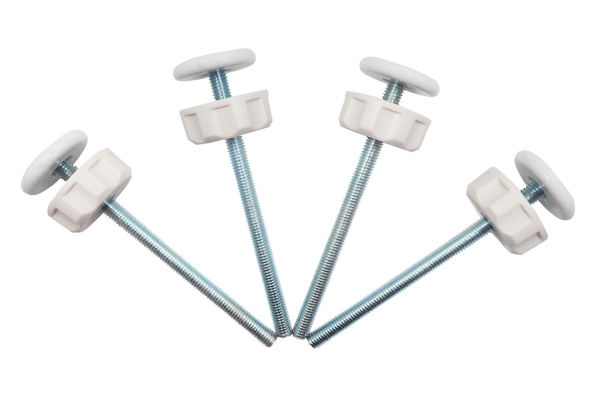 An affordable, extra long replacement set for if you've lost your pressure gate screws. 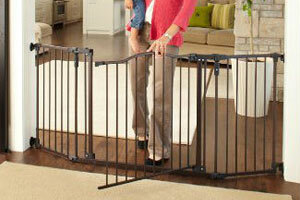 What Is The Best Retractable Baby Gate? 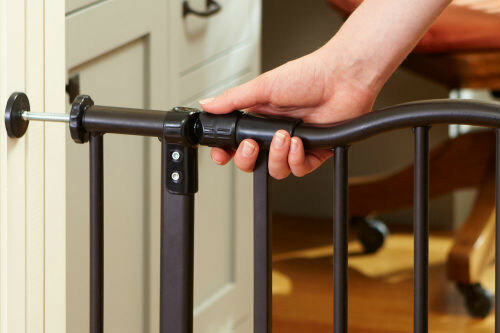 What is the difference between pressure mounted and hardware mounted baby gates? How'd we do? Do you have any experience with this topic, or any questions? Let us know about them in the comments below! Or, if we made any mistakes in this article, please kindly let us know in the comments below and we'll strive to make this website an even better resource.